What does localizing our food system mean? Choosing locally grown foods first is one simple yet far-reaching way that each of us can make a positive impact on our health, environment and economy since the daily need for food is one common thing that we all share. Localized food systems may involve growers, producers, processors, marketers, distributors, retailers, and of course eaters! Rebuilding local food economies means shortening the distance food travels from the farm to table. This doesn’t mean putting an end to all trade in food, or doing without oranges and bananas in cold climates. It simply means limiting the needless transport of food by trying to meet as many of our basic needs as possible, in season and closer to home. Much of this transport is unnecessary since identical commodities pass in opposite directions, crossing paths of import and export, a system that is not logic but that gathers momentum with governments’ systematic promotion of a single, globalized food system. In an era of dwindling fossil fuel reserves and rising CO2 emissions, this is both senseless and wasteful. fresher taste – with less distance traveled, produce will have more vitality and will taste more alive. more nutrients – nutritional content is kept intact with less time from harvest to ingestion. Foods that are frozen or canned within a couple days of picking have more nutrients than fresh produce that has been in transit for over a week. seasonally attuned – by eating local produce, we are attuned to the seasonality of growing. Eating seasonal foods grounds us within our environment and place in time. puts face to the food – honors the age old tradition of bond between eater and grower. It feels good to know those who grow and to help them keep doing it. 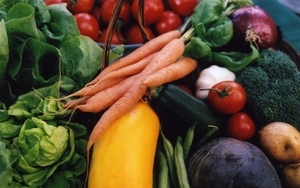 promotes genetic diversity – by purchasing from local market gardeners who grow many fruits, vegetables and herbs of several varieties, more types of seeds are saved and transmitted through plant generations, creating a more biodiverse ecosystem which thrives to encourage diverse wildlife and lowers extinction rates. preserves green landscape – we take for granted our picturesque landscape of lush crops, meadows and pastures, the red barns disappearing at a disheartening rate. 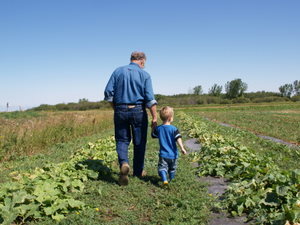 Family-run farms encourage green spaces that are habitat to diverse plants, wildlife, insects and birds, while agribusiness brings mono-cropping and hog factories. rebuilds rural economy – with this years farm profit margin at an all time low, the family farm is a vanishing breed and sucked down with it the health of our rural communities. If less primary crops (which Manitoba is a fertile centre for) were exported and more were consumed and processed here in our province to be eaten by prairie people we would create jobs while reducing the use of fossil fuels and reducing pollution emissions. ethical local economy – Spend your money or barter with personal and global responsibility in mind to increase the chance that it will circulate among ethical locally-owned businesses, not greedy multi-national corporations like Monsanto (biotech & seed), Phillip Morris (cigarettes and food) or Wal-mart (the largest retailer of food in America) that place dollars above the environment and human rights. Keep the cash circulating within your community and it also comes back to you quicker! How does Fresh Option support local economy? Fresh Option is a grassroots business that is dedicated not only to our clients, but to the people who are growing, baking, foraging, roasting and harvesting our food. We support certified, transitional and sustainably farmed family-run operations and community shared agriculture in Winnipeg and around Manitoba. We strive to provide a wide range of prairie grown foods that are fresh, healthy and grown with respect for the environment and the people working with it. We are thrilled to hear from the folks that grow these wonderful foods that they are able to produce more because of Fresh Option and our customers. We promote and local events and other businesses in our community by using our weekly newsletter as a bulletin board. We also spend our money as close to home as possible. We choose small local businesses to purchase our supplies, materials and services whenever possible. We are aware that food security in our community is an aspect of the local food system, and that everyone should have access to healthy, safe food, regardless of a range of challenges that make that difficult. FOOD donates organic whole foods to several community kitchens, food banks and shut-in deliveries including Food Not Bombs, West Broadway’s Crossways in Common (Stone Soup Kitchen and The Good Food Club), Kalle Shiva (assisting families and individuals living with HIV/AIDS, and Winnipeg Harvest. Oh, and randomly organic cucumbers or apples are offered up to surprised squeegee kids and other folks in lieu of a coin or a smoke.